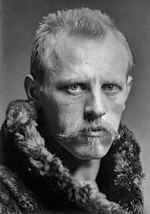 Fridtjof Wedel-Jarlsberg Nansen (/[unsupported input]ˈfrɪd.tʃɒf ˈnænsən/ FRID-choff NAN-sən; 10 October 1861 – 13 Mey 1930) wis a Norse explorer, scientist, diplomat, humanitarian an Nobel Peace Prize laureate. In his youth a champion skier an ice skater, he led the team that makkit the first crossin o the Greenland interior in 1888, an won internaitional fame efter reachin a record northren latitude o 86°14′ durin his Nor' Powl expedition o 1893–96. Awtho he retired frae exploration efter his return tae Norawa, his techniques o polar traivel an his innovations in equipment an claes influencit a generation o subsequent Arctic an Antarctic expeditions. This page wis last eeditit on 23 Februar 2018, at 19:40.